Clint Eastwood's J. Edgar is a 2011 film that I was very slow to catch up on. Touted early as a title to keep an eye on, the film never caught fire and made few year-end "best-of" lists. That's somewhat unfortunate because in some ways, J. Edgar is a fascinating portrait of power - one not delivered quite like a standard biopic, but more introspectively and conveyed with an intense, demanding performance at its heart by Leonardo DiCaprio as Edgar Hoover. The approach to the material is skewed to Hoover's relationship with his second-in-command Clyde Tolson (Armie Hammer), who might have been his lover. The result is a portrait of power that along with the introspection, could have used more sense of dynamism in its coverage of and explanation of some of the key historical events that the FBI was involved in throughout Hoover's lengthy reign. One senses that director Clint Eastwood allowed the film to get away from him in this respect. 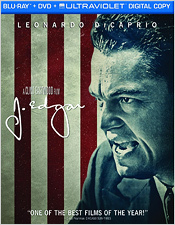 J. Edgar has been released on Blu-ray by Warner Bros. As conceived by Eastwood, the film was delivered as a very dark and strongly desaturated image and the 2.4:1 Blu-ray image delivers that look accurately. With all the darkness, image crispness lingers well though, and shadow detail is amazingly strong. There is no evidence of any untoward digital manipulation whatsoever. A 5.1 DTS-HD Master Audio track provides a competent but not attention-gathering sonic experience. Dialogue is clear and strongly-delivered when needed. Strong pyrotechnics are not this film's thing, but a bomb blast early on delivers quite impressively. The film has Eastwood's usual restrained music accompaniment and it shines subtly throughout. A French 5.1 DD track and English, French, and Spanish subtitling are provided. The disc's only supplement is the 20-minute featurette J. Edgar: The Most Powerful Man in the World that provides detail on Hoover's life with comments from cast and crew. I'd try a rental on this one first.